The body is amazing and even now much of how it functions is still a mystery. There has, however, been increasing research into the digestive system revealing links between it and our moods and mental health. We’ve also all seen the ads about ‘good’ and ‘bad bacteria. Here nutritionist Dr Lucy Williamson helps explain how these bacteria actively work together in our guts and how watercress helps them to do their job. Here comes the science bit! The trillions of bacteria present in our large intestine, known as gut microbiota, are pivotal in our health. These microbiota have more than three million genes between them compared to our own 20,000 and so their potential for influencing the day to day functioning of our body and therefore our health is clear. To better understand the current science relating to gut health and microbiomes, read here. Our microbiota make up an entire ecosystem which communicates with a vast neural network within the lining of our guts. This enteric nervous system is known as the second brain. It causes the sensation of nervous butterflies or a pit in your stomach that are innate parts of our psychological stress responses. Up to 90% of the cells involved in these responses carry information to the brain rather than receiving messages from it, making your gut as influential to your mood as your head is. Maybe even more. Our gut bacteria have evolved uniquely within each of us since birth helping to digest our food, fight off unfriendly viruses and bacteria and benefit our longer term health. To help protect our health the best they can, we need to eat foods which nurture them and encourage as broad a range of ‘good gut bacteria’ as possible. They then ensure less favourable bacteria are kept to a minimum. By influencing our mood with their involvement in the production of our ‘happiness hormone’ serotonin and other neurotransmitters, it brings a whole new meaning to the saying that ‘we should go with our gut’. This could give hope to those who suffer from anxiety or depression since studies indicate that those with healthy and diverse gut microbes are less likely to suffer from either malady. With this clear link not just to physical health but mental health, ‘Gut health’ is rapidly gaining popularity among the health-conscious. But while we don’t fully understand how our gut bacteria exert their many beneficial effects yet, we do know that we can alter our microbiome beneficially and rapidly, with diet. How? For that we need to look at the energy source for our microbiota; these are called pre-biotics. Pre-biotics are largely dietary fibre and polyphenol anti-oxidants known as Flavanoids (Selma et al 2009) (Ozdal et al 2016). Brassicas and especially Watercress contain extremely high levels of these flavanoids and of course, fibre. Additionally, research has shown a high correlation between polyphenols and vitamin C in brassicas and corresponding anti-oxidant activity (Martinez-Sánchez et al 2008). Watercress is a brassica with exceptional Vitamin C levels (43mg Vit C/100g) and in fact, gram for gram watercress contains more vitamin C than oranges. As Flavanoids are also known to inhibit pathogenic bacteria, (Yixie et al 2015), the potential in watercress as an excellent food to optimise our microbiome is clear. Watercress is already being studied for its ability to enhance patients’ responses to chemotherapy due to its isothiocyanate content. In addition, there is clear potential for its additional flavanoid antioxidants in reducing cancer risk and in chemotherapy success via their pre-biotic function. In being an excellent source of pre-biotics, watercress is likely to enhance energy balance and this, in addition to its recognised highly bio-available protein content for muscle repair and enhanced post-exercise rehydration, suggests its role in sports performance has much potential. We know a diet rich in fibre and polyphenols not only promotes our gut bacteria, but also ensures we benefit from the roles of vital metabolites in optimising our health and metabolism. Watercress has both! Interestingly, optimal digestion of fibre requires food to be well chewed, otherwise the immune system at the gut wall may respond inappropriately to it and damage surrounding tissues as a result. The characteristic peppery flavour which occurs on chewing watercress, signifying activation of another antioxidant, isothiocyanate, is therefore potentially helpful in ensuring optimal digestion of its fibre by the microbiota. Stimulates flow of bile – chewing watercress can help to stimulate bile flow from the liver. Bile helps to emulsify and digest fats and helps us digest and absorb vital fat-soluble vitamins such as Vitamin A and Vitamin E. Good bile flow is also necessary for efficient detoxification, as it’s the liver’s way of getting rid of fat-soluble wastes and toxins. Promotes healthy bowel regularity – crops known as ‘bitters’ which have a sharp, pungent taste or smell, like the peppery flavour of watercress, and are high in fibre, help to promote healthy and regular bowel movements and prevent constipation. Although we have evolved in a microbial world, it’s only recently that we’ve come to understand the benefits of these microbes in our health. Processed diets, an obsession with hygiene, caesarean births and a move to ‘live removed from the land’ have served to disadvantage our microbiome; new research is now helping us to understand how and why, we should nurture it. Prof Tim Spector at his Royal Society of Medicine lecture 2018, described sourcing a wide range of fibre in our diet as the single most important food habit in optimising our gut microbiome, he refers to it as ‘tending our inner garden’. 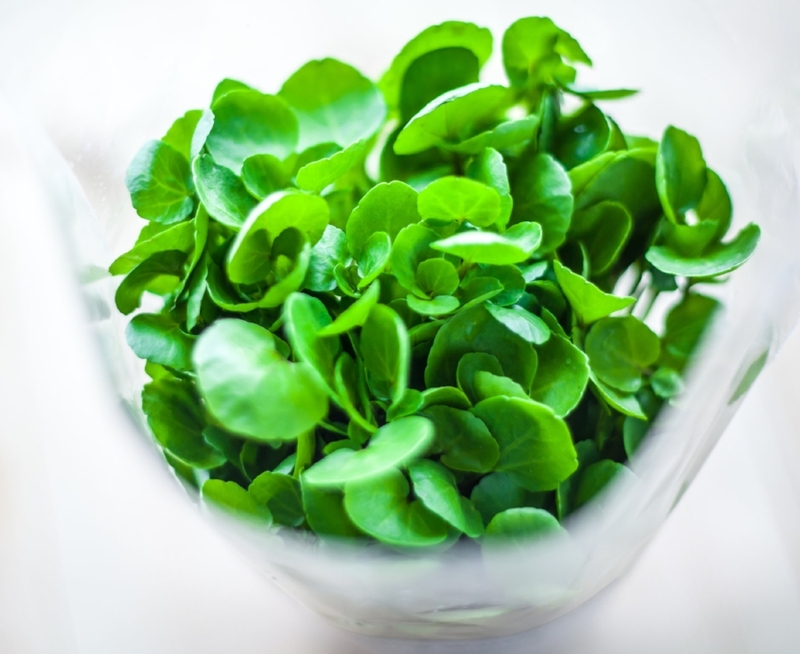 Watercress has very high levels of flavonoids along with Vitamin C which had been shown to enhance this effect. Combined with its fibre and year-round availability it’s a remarkable leafy green and should be included to maximise our gut microbiome and therefore our long-term health and performance. Additionally, watercress has the potential to play a key role as part of a recovery diet after illness, pregnancy and antibiotic treatment, all of which are known to reduce our microbiome. Wonderful Watercress! What are you waiting for? Eat more to keep healthy and cheerful! I am a Registered Nutritionist working to inform and inspire better health for all. Previously a Vet and with a family of my own, I understand the need for practical, evidence-based Nutrition advice within busy lives. My focus is on achieving healthier, happier lives through sustainable good food choices, giving clarity amid confusing ‘healthy eating’ messages. Sharing Nutrition knowledge is my passion and, I believe, beneficial to all! Follow her on Instagram @lucywilliamsonnutrition for practical meal ideas for busy families too! Watercress - food fit for Gen Z and Millennials!